Here's another card I made today towards my 100 cards in 100 days goal. 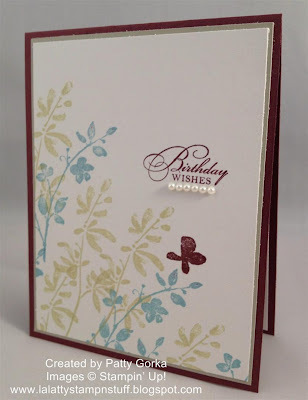 I made this for today's color challenge on splitcoast stampers. I love these colors together and I'm glad I found some time to play along. I simply stamped the flower and leaf images and then I stamped my sentiment and next I added my ribbon. Super quick and easy! I really liked the way my card above turned out and so I decided to go ahead and try making another one. This color combo came from the color coach and I love it! I'll have to use this one again for sure! 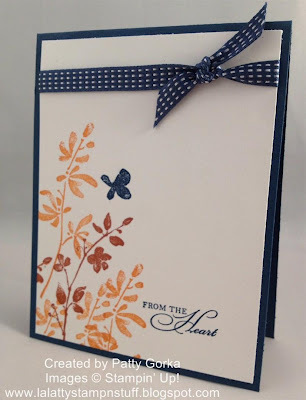 To make this card I just stamped my images, added my sentiment, and a few pearls! These are beautiful! I particularly like the second one - it's an unusual combination but it really works. Great cards! I reall like the color combos. Great cards Patty! I like the layout too...TFS!! !